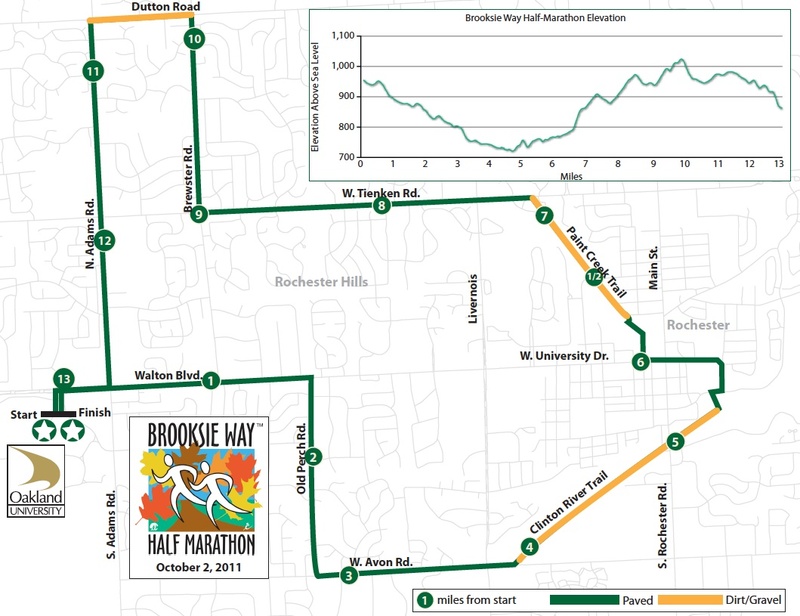 I'm planning on stopping at the Brooksie Way expo tonight after work. While it's a smaller expo, sometimes they have last year's shirt on sale for $5. I did that last year. Can't beat the price for a great training shirt. I'm also in the market for a new pair of Saucony's and hoping they have them on sale at the expo. If not, I'll wait and see what the Detroit expo has since that one is so big. I saw a pair of Ride 4's at the Crim expo in August on sale for $75. I'd rather spend $50-60 but I suppose that's not too bad for the current year model. I tend to run in last year's model when I can find them online cheap. Yes, I'm cheap but with the number of pairs I have to buy a year, it adds up! I'm also still planning on being there on Sunday with my Cowbell to cheer on the runners. The plan is to be right around the 8 mile marker. This is just when it's starting to get hard. See the map below. Speaking of running, I looked at my Dailymile log and I'm at 1524 miles for this year! Wow, I didn't think I'd be that high but I suppose running two marathons in the same year will do that. That's like running from Detroit to Yellowstone Park. Yikes! I would guess I only ran 1200 miles all of last year(I didn't track the entire year) I can't imagine some of you out there who run a marathon a month. Your miles must be unbelievable! Question of the day? How many miles have you run this year? Hi there! I am your newest follower! I love love love the design of your blog! Awesome. Can't wait to read more! 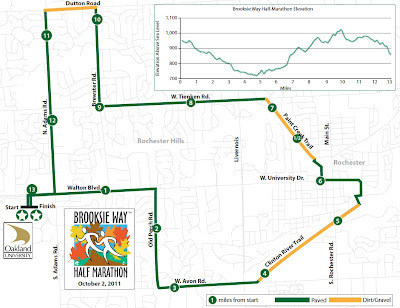 I'm running on Sunday; I'll look out for you around mile 8!! Nice milage Jeff!! I am around the 1500 mile mark too. Do you ever shop on running warehouse? you can get an extra 15% off sale shoes if you "like" and access the promotions page on their face book page. Maybe you will find your shoes on there. Gotta love the weather man... ! I must be odd.. I have always enjoyed running in the rain - although at 50 degrees it is a mite cold. Your running DWARFS mine for the year - but I'm enjoying following along! 1200ish for the year so far and training for a 50 in December, so still many more to go! I remember last year setting out to run 1000 miles in a year as I was just getting started. I thought that 1000 miles was an insane amount, but now realize it was easily doable with smart training. Love your blog man! Good luck with the Sauconys and looking forward to seeing if I win the Sport Hook giveaway! Shortgirl - good luck! It should be great weather. Steph - I tried running warehouse but they don't have them anymore. Once and Future Runner - whatever the miles, that's awesome!